Jonn Serrie has drawn worldwide acclaim for his film and planetarium soundtracks. Gary Stroutsos expresses his passionate aquaintence with native cultures through his flute playing. Both have released several albums in their speciality and risen to the forefront of their respective genres. 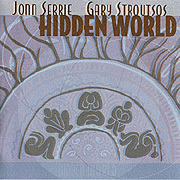 Together, Serrie and Stroutsos combine talents on their elegant and evocative album Hidden World, a respectful meeting of twenty first century technology with the beautiful basics of the styles and flutes of various indigenous cultures. The pieces that fill Hidden World revolve around Stroutsos' melodic flute playing over Serrie's warm synth pads, environmental textures and gentle ethnic rhythms. While Serrie primarily provides harmony and atmosphere, Stroutsos performs traditional melodies from his collection of native flutes. The mood of the compositions on Hidden World easily shifts from deep space to the earthly spiritual, from the darkly ceremonial to drifting serenity. The result is an absorbing and beautiful collaboration which demonstrates the abilities and sensibilities of each artist.